Intel refers to the X299 platform as “High-End Desktop” (HEDT), but the term “high-end” means different things to different people. A gamer might think the top mainstream parts are better because they support higher overclocks, while a power user would scoff at that platform’s lack of connectivity. The overlap continues as the cheapest HEDT components don’t even have any of the features called “high end” when placed on a mainstream platform. Conversely, some boards far exceed “high-end” expectations. 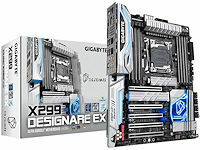 And the X299 Designare EX’s feature set places it among these elite parts. Is it worth the price?